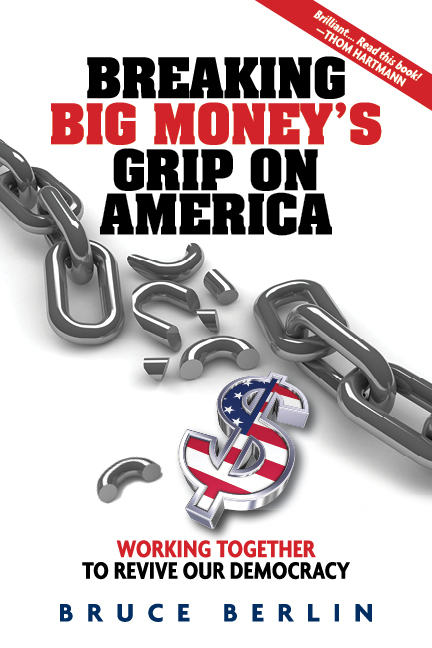 “Breaking Big Money’s Grip on America is a well researched, articulate, cogent expose of how “Big Money” has taken root in our country, mostly in near silence, to unduly influence our elections and public policy. Author Bruce Berlin makes a convincing argument that the United States has become a plutocracy, government of and for the very wealthy, aided by decisions of the Supreme Court, Congressional legislation, billionaire donors, and large corporations seeking profits and power. To break this chain, and reestablish our Founding Fathers’ principle “government for the people, by the people, and of the people,” Berlin aptly examines American history, calls for a broad-based Democracy Movement and explains how to do it.” — Michael R. French, award winning novelist of The Beginner’s Guide to Winning an Election, Once Upon a Lie and The Reconstruction of Wilson Ryder.